A few weeks ago, I was invited to check out the Victorian Farmstead owned by Adam and Laura Parks. Their logo is "Life's too short to eat crappy meat" which I thought was true and funny. 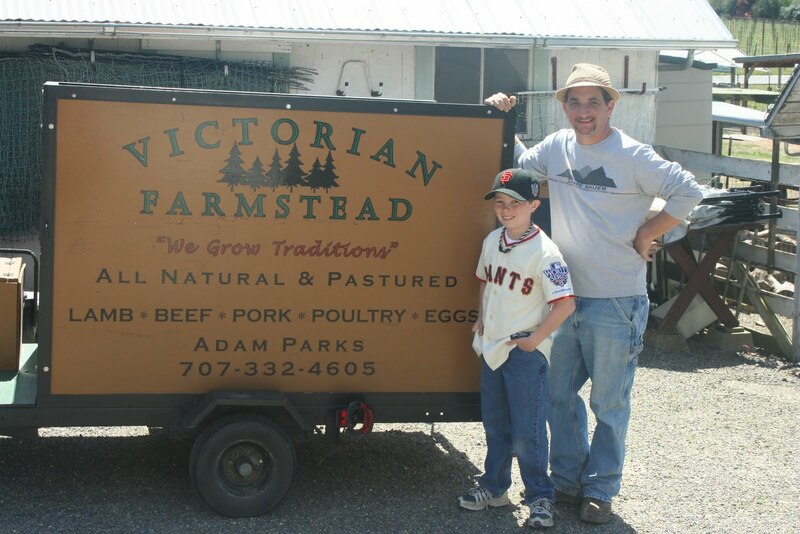 At Victorian Farmstead, their goal is to raise all natural, pasture-fed poultry and eggs. They are partners with Loren Poncia of Stemple Creek Ranches (Tomales/Marin Co. area) for the best beef, Pete Langley of Langley Show Pigs (Petaluma) for the best pork and Chris Cornett (Marin Co. area) for the best lamb as well as the Parks Family. All of these guys are local and grew up in the area. In fact, my mom went to school with all of them but Mr. Langley. When we first got there, I was greeted by Adam, his son Jackson and Jackson's friend. We headed to the chop shop which is where you can pick out fresh meat to buy. We checked out the eggs he had. I brought a store bought egg and Adam gave me a Victorian Farmstead egg. I cracked them both open to see the difference. The one from Adam was actually very hard to open. The store bought egg was light yellow and mushy and fell apart when you first picked it up. 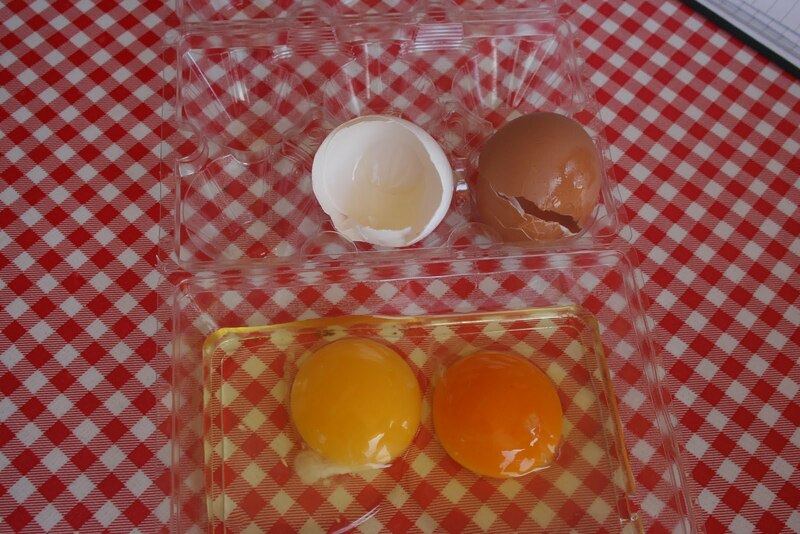 The Victorian Farmstead egg was a dark orange, like almost a Giants orange, and its membrane was hard to break, very hard. The yolk was thick and sticky. The store bought egg was slimy and runny and it did not stick to your finger at all. We then went and checked out the meat chickens which were a few weeks old. 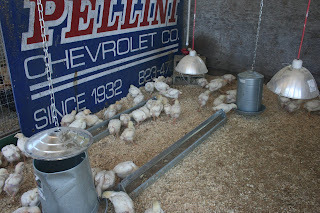 When they first arrive at the farm the chicks are in the brood room in the barn first for two weeks, then they go into the pens or “coops” for two weeks, and finally out on pasture for the last 4 weeks until they are harvested. Adam keeps them in these things he calls tractors. They all looked very happy. The laying chickens live next door and are free range all over their property. At the completion of our tour of the farm, we went back to the chop shop and purchased some eggs, a chicken and some steaks to try. Adam gave me a complimentary sample of ground burger which was excellent and some quail eggs to try which I absolutely love and some really great bacon. The quail eggs are very small and buttery and you can't even taste the egg white. My mom roasted the chicken using a recipe from Tyler Florence. It's stuffed with onion, garlic, citrus and herbs and the skin is coated with herb butter and then the chicken is wrapped in bacon and roasted. It turned out to be very, very good. 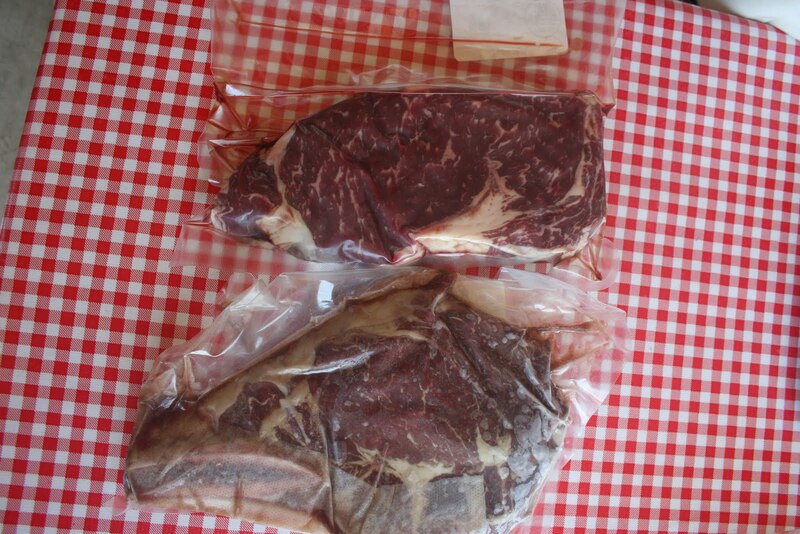 We bought a rib eye and a fillet Mignon steak from Adam to try. We bought a store bought rib eye and fillet to compare. My parents had me blind taste each steak and out of all the steaks, I loved the one's from Adam. Those were the ones I picked. They had more flavor, they were juicy and very tender. So from all of this I learned that "Life is too short to eat crappy meat AND eggs and poultry too". Farm fresh, natural meat and eggs is a lot better than store bought. Victorian Farmstead has a monthly meat box program and they are also at the Farmer's Markets. EVERYONE should check them out and try it. You won't be disappointed! Thanks Adam and family and I hope to see you around. Sebastopol Little League Baseball -The Best Snack Bar in the WORLD! Whenever I have little league baseball games at Clahan or Polley Field, I always go to the snack bar. At Polley Field (named after "Grandma Polley"), my friend Kaija and I, hang out at the mg nest (me and Kaija's eating area/fort that looks like an mg nest). The hamburgers rock! In comparison to fattening fast food, they make your food to order and offer vegetarian choices for people that are vegetarian, such as: veggie burgers, salad, baked potatoes and more. They also have an array of hot dogs and polish sausages with all of the toppings like sauerkraut, relish, peppers, onions, ketchup and mustard, hamburgers with or without cheese, homemade cheese or chicken quesadillas and lots more. A lot of work and planning is put into our snack shack thanks to the coordinators, Kim Merlaud and Alicia Garcia and lots of parent volunteers. I truly believe that it's the best little league snack shack that I've ever been to. The snack bars at Clahan and Polley Fields are open at around 5:00 PM everyday of the week and during the day on weekends. So, if you are looking for something to do and want a really great meal for a few bucks and you want to support a great cause AND watch a great baseball game, come and check it out! You won't be disappointed...the food is so good and the games are so much fun, you'll feel like you're at AT&T Park! Polley Field is located in the same area as Ives Park behind the Sebastopol Fire Dept. and Clahan Field is located next to the Sebastopol Community Center on Morris Street in Sebastopol. Hope to see you at one of my games! If anyone reading this knows of any other little league, Cal Rip or Babe Ruth league that has an awesome snack shack, please post it so I can check it out. 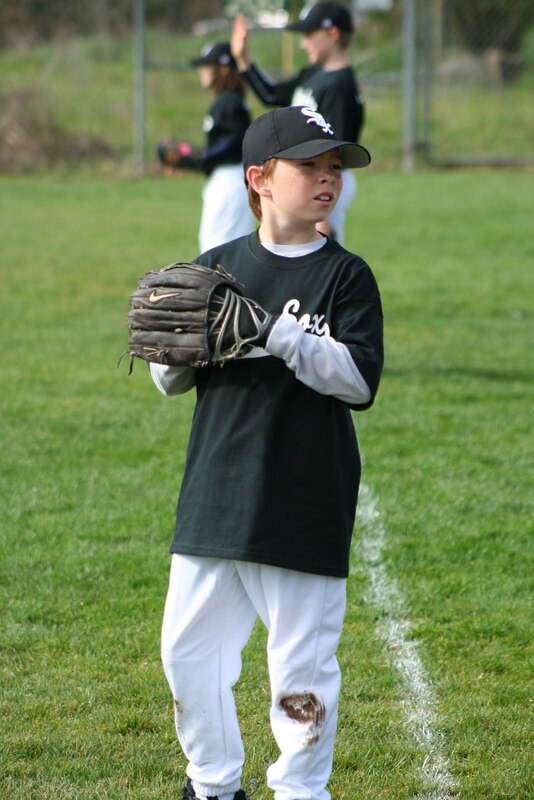 Sebastopol Little League's website is: www.sebastopollittleleague.com and they are on facebook too!